After living in New York for a little more than a year I've learned, among other things, to not buy anything full price, as the sales at the end of the season are plentiful. Actually, I would call them mid-season sales, because even though the Spring items start arriving in stores in January, it's still winter weather-wise and you still have time to wear your great sale finds. Knowing this, I had been going uptown to Bergdorf Goodman, to see what items they had in stock and what I could buy when it came down to sale time. For the past few months I had become obsessed with the satin Prada shoes with the curved heel, the Miu Miu colorblock pumps, a pair of YSL grey pumps with a slight pointed heel and a beautiful geometric wooden heel and the Marc by Marc spectator high-heel in grey/blue. 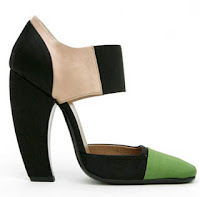 I ventured uptown over the weekend to try my luck, and see if any of the shoes I had been coveting were still at the store, waiting for me to bring them home. I walked inside the store and saw that I wasn't the only one waiting on the sale, as the store was as packed as the H&M on 5th Ave during the Thanksgiving weekend. I made my way to the second floor after checking out the Marc Jacobs bags they had on sale (the cheapest one was 800 dollars, not exactly affordable right now), and finally I was in shoe heaven. Surprisingly enough, they had all the shoes I had been obsessing over, but something weird happened. After the initial rush of "OMG It's here!" went away and I analyzed each shoe objectively, I found myself less than enamoured with each of them. The Prada shoes that I had lusted over for so long, didn't seem special anymore, they just looked like I was trying too hard. 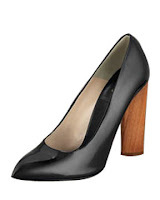 The YSL pumps were still magnificent, but not very practical for my new non-SoHo job. 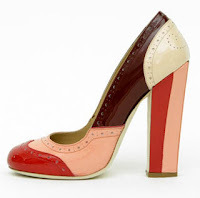 The Miu Miu pumps were distorted into clown shoes and started to look cheap. 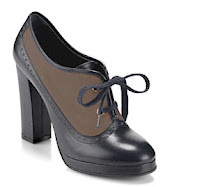 The Marc by Marc spectators looked awkward on my feet, had I only wanted these shoes because they were unattainable? Had all the fashion shoots that featured them throughout the months made them a ubiquitous and taken away their allure? Maybe yes or maybe not or maybe it was just a combination of both. In the packed sale racks I also picked up and put back: a pair of Martin Margiela degrade flats (too expensive, elastic back), a pair of Marni black flats (I already have black flats) and a pair of the Dr. Martens inspired maroon Chloe booties. I had loved them since I saw them on the runway, but never thought I could wear them or much less pull them off. I picked them up, examined them and put them back on the rack. I wandered around the rest of the store and left empty handed. With the shoes still on my mind, I headed to Barney's to see what I could find there. Nothing. That's what Barneys had in store for me (if you wear a very small or a very big shoe size, I definitely recommend heading there, as they have a great selection of shoes, but not so much in the size 38 range). I left Barneys with Chloe still in on the brain, so I went back to Bergdorf's to give them a second chance. 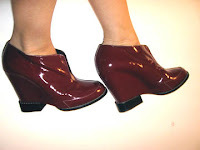 I found a pair in my size (they also had them in taxi cab yellow), but I figured the maroon made more sense. I tried them on, it's crazy how comfortable they were! I asked to try the other shoe. I put them on. I looked at myself in the mirror. They would surely make even the most boring t-shirt and jeans combo look like a million bucks. They would be me "Congratulations you got a new job" and my Christmas present to myself. And so, still surprised at myself for preferring these things over the refined and lady-like Prada heels, I did it. I bought them. Apparently, I was the kind of girl that wears clunky, borderline ugly but super awesome shoes. I didn't feel guilty about it, but I did feel guilty about not feeling guilty. those are so great! of course, any Chloe heels would have garnered the same response from me but what an epic find!